Raf Simons’ obsession with the Stan Smith continues on to Spring/Summer 2016 as he unveils the Stan Smith Strap style under the adidas by Raf Simons label, the collaboration between sportswear giant adidas and the designer. With Spring/Summer 2016 the collaboration relies on the three characteristic carry-over styles Stan Smith, Ozweego 2 and Response Trail, and the newly introduced style adidas by Raf Simons Stan Smith Strap. Making his mark on adidas’s most coveted tennis shoe, the adidas by Raf Simons Stan Smith combines elegant leathers with the iconic ‘R’ perforrated quarter. Besides the classic white, it will also come in the two shiny colorways of light cooper and silver. For this season they are also introduced in shades of blush yellow and ash pink, as well as version in night marine. For the Stan Smith Aged, elegant leathers were given a vintage beat up treatment, in all over black and white. The adidas by Raf Simons Ozweego 2 takes a futuristic approach in a layered upper with a running-inspired profile and transparent silicone windows. It is offered in tones of khaki and deep green, completed by one model in black, blue and brown tones. Visually inventive and riotously colourful, the adidas by Raf Simons Response Trail 2 is updated for Spring/Summer 2016 in white/green or red/blue and comes with two TPU heel spoilers for different looks. Besides these 3 classic styles which became well known silhouettes over the last seasons, the adidas by Raf Simons Stan Smith Strap is introduced as a complete new model for Spring/Summer 2016. Raf Simons requested a buckle strap version of the Stan Smith bringing a new twist of refinement to the original comfort Velcro straps from the 1980’s. Elegant leathers combined with the Raf Simons branding and offered in nostalgic colour ways. Presented this June during Paris Men’s Fashion Week, the footwear range will hit retail in mid February 2016, with retail prices ranging from $455 – $730. 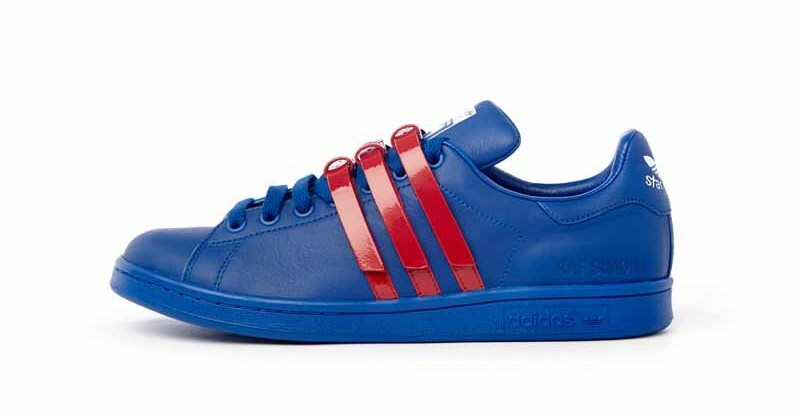 Available at the adidas concept stores in Paris No42 and Berlin No74 as well as select boutiques around the world.